September 21st, the Feast of St. Matthew, Apostle and evangelist, the four communities (Bunya, Namuntuntu, Shambyu, Tondoro) of the Missionary Benedictine Sisters of Tutzing in Kavango Region came together to celebrate our Foundation Day at St. Scholastica’s convent, Namuntuntu. The celebration was very different from the way we normally celebrate it. This day was a day of prayer and reflection on how we are living our vocation as Missionary Benedictine Sisters today. The Sisters arrived in Namuntuntu between 9:00a.m. and 9:30a.m. At 10:30a.m. the Sisters gathered in the Church. The organizer, our dear Sr. Beate Schroter, heartily welcomed and thanked the Sisters for coming and wished them a joyful day of prayer and meditation on the Word of God and our vocation. Sr. Beate encouraged us that our call to follow Christ as MBS Tutzing is based on the daily prayer and reflection on our vocation. If we want to be transformed, we must be willing to listen to the Word of God and ponder it until it transforms us. We are to keep in mind that our main bread in this vocation is the Holy Bible. We have Mary the Mother of Jesus as our model. Let us look at her and learn from her. She is a woman of faith, who listened with her whole heart, humbling herself in obedience and receiving the Word of God with joy. We, too, if we want to persevere in our vocation, we are to have courage so that we may have true love that takes away fear from all difficult situations and humiliations we encounter day by day. Each Sister then was given a time for private meditation and prayer. At 11:30a.m., we had Holy Mass celebrated by Rev. Fr. Krumsheid, OMI. In his sermon he said, “As a religious called by Jesus and like St. Matthew, we are all called to follow him, to be strong in our faith. We should stand firm in our vocation, not to be occupied by this material world so that we will be true witnesses to the Word of God.” After Holy Mass, we had lunch which was so delicious. At around 2:30p.m., we went back to the Church and we were divided into three small groups to share what touched us most from the Scriptures and the life of Mother Mary together with our vocation. 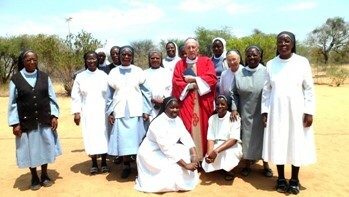 On behalf of all the Sisters, Sr. Thekla thanked Sr. Beate for making this day special and she thanked God for Sr. Beate’s presence in our communities in the Kavango Region. This day was indeed a day of renewal when we could reconcile with fellow Sisters. We deepened our religious vocation through praying and sharing on the Word of God. We concluded our day with a braai (barbecue) at early supper followed by the departure of all the Sisters for their respective communities.